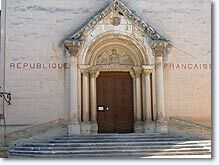 Departement of Vaucluse - Pop. 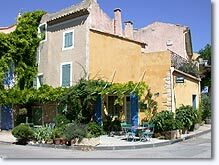 : 1,200 h.
Situated 17 km to the east of Carpentras via the D942. Villes sur Auzon is one of the starting points to discover the unspoilt gorges of La Nesque: you can admire this spectactular canyon 400 m deep by following the Nesque river for about twenty kilometres, from Ville sur Auzon to Monieux. 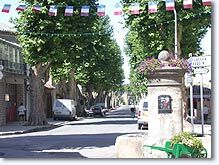 A short circular car trip will enable you to go right round the canyon, either leaving Ville sur Auzon to the west, or leaving Sault to the east (on foot, allow 2 and a half hours for the return trip on the GR9 hiking path, waymarked in brown). The road quickly climbs above the plain and gives you some spectacular views of the gorge for a few minutes. Though not as huge as the as the Grand Canyon or the Verdon Gorges, it's still very impressive. From the road you'll see the sheer sides of the gorge, covered with vegetation or just bare rock, but you won't see the stream at the bottom of the canyon. 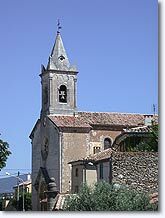 The highest point of the gorge (872 m) is the viewing point at Castellaras, 3 km from Monieux... dizziness is guaranteed! Then the Nesque disappears underground, to re-emerge at Fontaine de Vaucluse. From the highest point of village you'll be able to admire the panoramic view of the La Nesque gorge and the silhouette of the giant of Provence, Mont Ventoux. 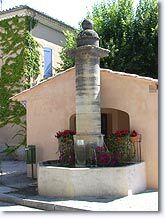 The village of Villes sur Auzon is enchanting, with its ochre houses, its old fountains, its narrow streets and peaceful Provencal atmosphere. Two instrument makers live in the village (making flutes and guitars). Whatever you do, don't miss market day every Wednesday morning. Here you are in the land of Good Eating and Good Drinking... ! 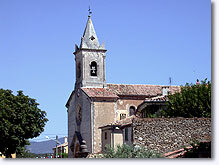 Flassan (4 km), Blauvac (5 km), Mormoiron (5 km), Méthamis (6 km).